Maurine has been living with HIV openly since the early 2000s. At that time, there was little access to treatment in Kenya and a lot of stigma around the disease. In 2002, she was expecting her first child, but could not access vertical transmission services; her son contracted HIV from her at birth. Maurine and her son began treatment in 2003 when the Global Fund came to Kenya and Maurine has since had another baby who is HIV-free. Now both mother and sons are healthy. However, Maurine has lost count of how many times she has been treated for malaria, including three times when she was pregnant with her second son. HIV increases the risk of malaria infection, particularly amongst pregnant women. Through her lived experience, Maurine saw the inequalities and vulnerabilities young women and adolescent girls living with HIV experience. In 2008, Maurine founded the Lean on Me Foundation, an organization that provides comprehensive care and support to adolescent girls and young women living with HIV and affected by tuberculosis (TB) in Kenya. Maurine has recently returned as Lean on Me’s Executive Director. She is a board member representing Communities on the Global Fund Board and is the Communities Representative at the TB Stakeholders Association of the TB Alliance. 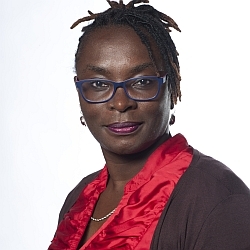 Maurine is also a member of the Steering Committee of Women 4 Global Fund and the Global Fund’s Community Rights and Gender (CRG) Division Advisory Group. In Kenya, Maurine is a member of Gender Technical Committee on HIV and AIDS. Previously, she was the Global Fund Coordinator at ICW Global. Of the 1.6 million people living with HIV in Kenya, 950,000 people are currently on treatment through the Global Fund. Since 2003, the Global Fund has provided Kenya 14,700,000 malaria nets.